Product prices and availability are accurate as of 2019-01-13 14:33:12 EST and are subject to change. Any price and availability information displayed on http://www.amazon.com/ at the time of purchase will apply to the purchase of this product. 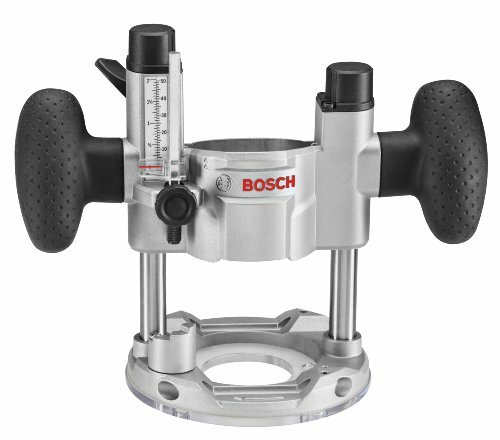 The new Bosch PR011 Plunge Base is designed to expand the versatility of the Bosch palm routers. The PR011 offers exceptionally smooth plunge action and simple micro fine depth adjustments with depth scales printed on the tool in both-Inch and metric measurements. The plunge base offers fast and accurate depth setting with a 7-step depth stop, two of which are adjustable. The PR011s plunge lock lever is conveniently located near the left handle and springs to the locked position when released, as most users prefer. A clear sub-base allows woodworkers to see their work piece at all times, and the units precision centering design makes it easy to adjust the sub-base to keep a bit on the intended cut line when using jigs, templates, dovetail fixtures and other guidance devices.